Dedication to Lean requires a focus on change, the identification of areas of improvement across the enterprise and a commitment to monitor continuously. The real challenge to Lean, however, requires this first change, a shift in the culture. 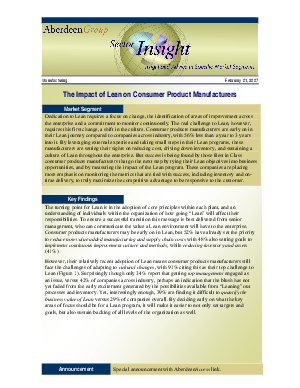 Consumer products manufacturers are early on in their Lean journey compared to companies across industry, with 56% less than a year to 3 years into it. By leveraging external expertise and taking small steps in their Lean programs, these manufacturers are setting their sights on reducing cost, driving down inventory, and sustaining a culture of Lean throughout the enterprise.